SKU: 1545561371. Category: Toys & Hobbies. Tag: Solar toy. The solar powered toy kit enables children to build everything from a solar airboat that rides over water to a solar puppy that moves its head and wags its tail. 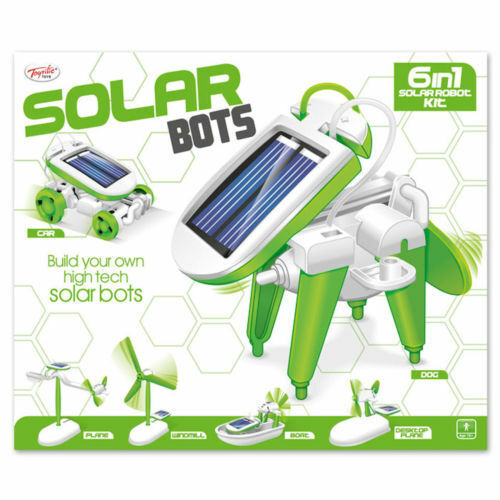 Easy to read instructions and snap together pieces enable children to build the solar toys in next to no time, especially with an adult present to guide them through the set-up process. Lights up when in operation and makes a series of typical robot noises. To top it all off he even dances on command, accompanied by his own backing music. Size varies with each transformation but the hull of the boat element is 11cm x 6cm x 1.5cm for perspective.